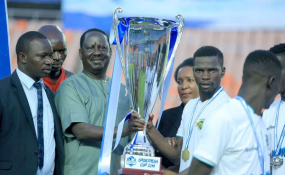 ODM leader Raila Odinga (third left) presents a trophy to Kariobangi Sharks players after the match against Bandari in the SportPesa Cup final at National Stadium in Dar es Salaam, Tanzania, January 27, 2019. Nairobi — Former Prime Minister Raila Odinga's Spokesman has allayed fears of ill health following a scare during a football event in Dar es Salaam on Sunday. According to Dennis Onyango, a video showing Odinga's aides holding him as he appeared to stumble had nothing to do with his health and attributes the incident to an unstable podium. "Hon. Raila Odinga is fine in Dar. Images of security people holding him emerged from a step on the podium that was falling off and not anything to do with health. Thanks though to everyone who has expressed concern," he stated. The video shows Odinga's security detail supporting from the podium, leaving others to continue with a function where a trophy was being presented.